Buying books had been a regular practice at home when I was in my 6th, 7th standard. Right from old hindi classics, books on banking and law - contributed by dad, we had our own small section with "Modern All About GW-BASIC for Schools and Colleges" (this one is my first programming book, and no matter what I can't pass it to anyone), "Techniques In Pc Game Programming" by Ashok Harnal, a Turbo C++ book by Robert Lafore (4KB ram was luxurious at that guy's time), many books on computer graphics, a few on AI by the time I was in 10th. But things gradually stopped, even my reading habits, reasons are obvious, board exams, then coaching for IITs, 1st year in college hostel with a ban on Laptops, 4:30pm to 6:30pm limitations on movement, 2 gate passes a month, snail speed internet access, limited lab timings, too many tests to write... etc etc. I think now is the time for all that to change. You might also argue that everything is available as ebook these days, just download and read. Sorry, that hasn't worked for me since last 2 years. The only book I read page to page in-front of a CRT was "Stealing the network - How to own a box. ", all because it was inspiring, exciting, a great mix of fiction and reality, and at that time I desperately wanted to become a so called "hacker" - the term that media uses for all wrong reasons. Another thing I realized that I do not need books that replace manuals any more. A book that describes how to use a software/tool/framework is no longer worth the buy. Instead a book that influences me, talks about useful techniques and better ways to do things is much better. Taking a clue from Jeff Atwood and Joel Spolsky's book recommendations I made the following list. Once again I went to Landmark, again to be disappointed. The only book that was available from my list was the last one in green :(. Even Sapna book house might have been the same. At Landmark most of these books were out of stock. "Universal Design for Web Applications" and "Programming Collective Intelligence" would be a nice read on the way back from college. Both are around 200 pages and wont take time to finish. "Building Scalable Web Sites" would be another valuable book to read. There's not much to speak about "Code Complete 2" and "Zen and Art of Motorcycle Maintenance" as many people have already shared a good opinion about them. I'm missing on "Beautiful Architecture" right now, the book talks about many interesting tools, apps, etc like Facebook, Xen, KDE, Emacs, and many more things. I believe a book that takes real world examples can teach much better. Hola 2010! 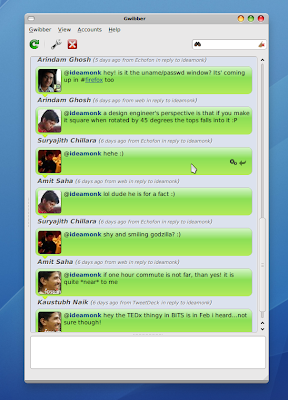 I was trying to add my recent css3 gradient and round corners gyaan to Gwibber themes. 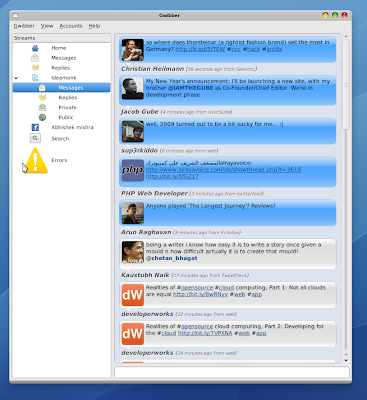 Gwibber is an open source microblogging client for GNOME that supports Twitter, Jaiku, Facebook, Pownce, Identi.ca and other popular social web services. Even though it crashes, sleeps for long hours, doesn't run in the first place in some cases, yet you can't ignore its presence if you're a desktop Linux user. No matter how much you hear stories about its fails, it still projects itself as a promising, well-integrated micro-blogging client for future. 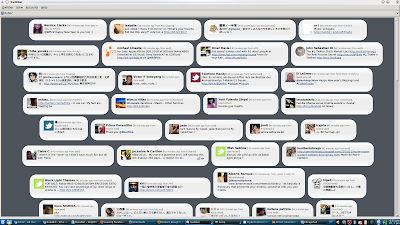 Though I missed on the css3 box shadow in these themes. Somehow -webkit-box-shadow is not working. 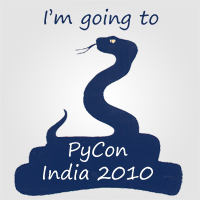 According to this mailing list post and snapshot, it should be working in pywebkitgtk. I wonder why!